When it comes to comparing, I am the worst offender. I look at what other people have, their career, material goods, or more time, and I often wonder what it would be like if I had those things. One of the best pieces of advice comes from Jon Acuff’s book Quitter. “Never compare your beginning to someone else’s middle.” This can be applied to every aspect of life. 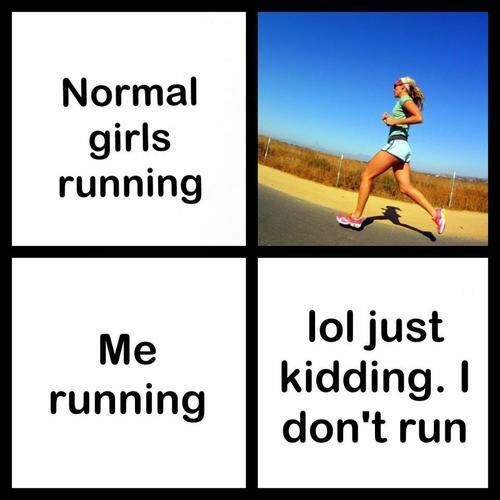 I hate running. This image could not describe me any better. Then I ran an 1/8 of a mile. And I gave up. (Disclaimer-I was never really “in it” to begin with). This is true for other aspects of my life. I want to be further along in my career. I want to provide better financially for my family. I want a nicer car. I want the awesome website. I want the coaching and consulting business. When it is something I really want, and I see someone doing it already, I become discouraged. If someone else is already doing it, and doing it well, then why should I even try? I want to be where they are without the time or effort they have put in. And this thought processes steals the joy from where I am right now. The joy of life is found in the small moments. It is found in being thankful for what I have and where I am in the journey. When we long after what we do not have by comparing ourselves with others, we lose the joy that comes with the journey. I’m reminded no one has the same worldview, experiences, personality, skill set and strengths as I do. This is why the world needs my voice. This is why the world needs yours. There is no one who is exactly like me. If you are just starting out on building your dream, don’t compare your beginning to someone else’s middle. They have put time, effort, and sacrificed to get where they are now. There may be a book written on the subject you want to write on, but it’s not written with your voice. Don’t compare your theoretical book to the books already written. The world needs your words. Don’t compare your artistic ability to other artists. They don’t have your talent or eye. The world needs your drawings. Don’t compare your IT skills to the person who has been building websites for years. The world needs your service. Don’t let comparison be what is stopping you from pursuing your dream and living a purposeful life. The world needs your dream. How or what are you comparing to others? How can you be more you today? Share below! The “F” Word: Is the Risk Worth the Reward? My three year old has recently discovered a fear of bugs. Literally out of nowhere. This proves difficult at times…like anytime we go outside. Some days the fear is great. Other days she has forgotten that bugs exist. I was talking to a co-worker the other day about an adventure she went on. She repelled down a cave and had to go through a very small space to get back out. I told her she was crazy. And then it dawned on me. What will people think about me? 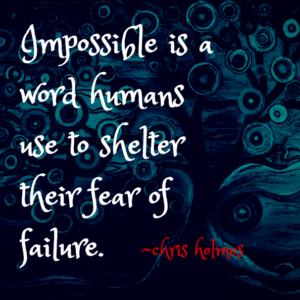 What if I move forward with what I think I am supposed to do, but fail? And then I remember; those in my life may think, say to me, or what they may say about me, they are simply living in a place of fear themselves. They are uncomfortable with what I may be called to do as they only have their experience and worldview to draw from. When they voice their fear, the comment usually comes across in a negative tone. I have also experienced the sarcastic remark when I tell of my dreams and what I want to accomplish. The potential reward has to be greater than the risk being taken. Until I realize that, until you realize that, we can never live up to our full potential. We tend to live in a place of “what ifs” without exploring the depths of what could be. If time were not an issue, what would you want to do? If you had all of the money in the world, how would you spend your day? If you could go on any adventure, what would it be? If you don’t do _________ (fill in the blank), will you regret it? The greatest reward we can give ourselves is to choose to live in a place that allows us to take healthy risks. Understanding this concept will help you move to taking greater risks. Risks that can have abundant rewards. The reality is that we are often our worst critic. 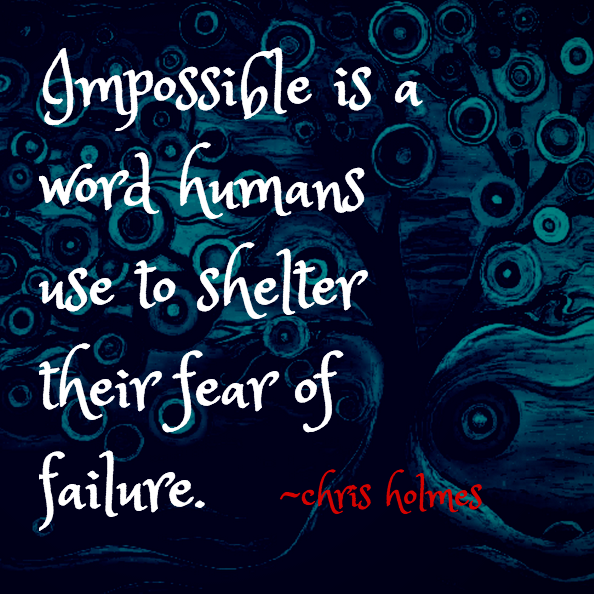 If we can get past the negative comments that play in our head, we have overcome half of the struggle. There will be those in our life that respond to our dreams negatively, but I find that often people simply smile when I share my goals and dreams. And my three year old? 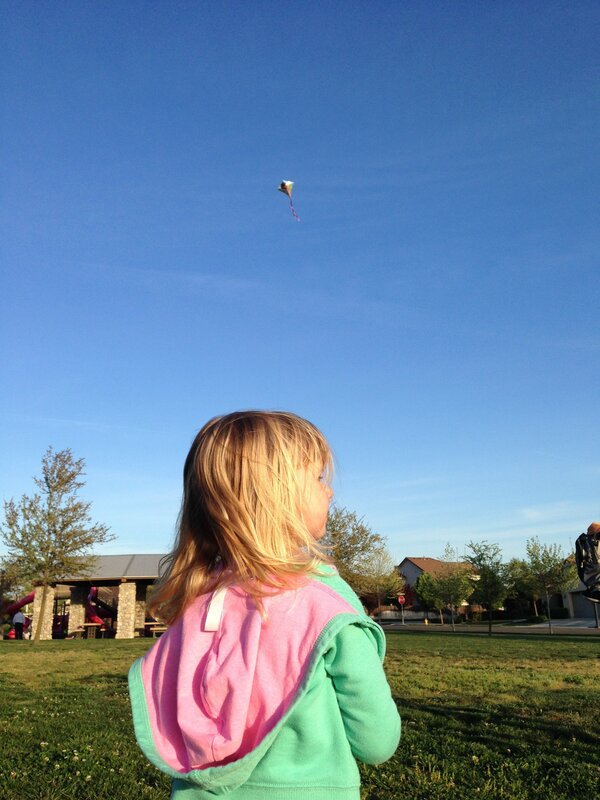 She decided that being outside flying a kite on a windy day was worth the risk of coming in contact with potential bugs. Have you googled the word leadership lately? There are 479,000,000 results in .57 seconds. That is a lot of information! Not all of those results are going to produce information that is intelligent or even helpful. But there is some good information buried somewhere in those results. How about books on leadership? Have you stood in a bookstore lately or browsed Amazon to see how many books there are on leadership? According to Forbes, between 600,000 and one million books are published each year. 50,000 of those books are on leadership. If you are on any sort of social media, you are most likely inundated with leadership information. Everyone seems to be an expert these days on Twitter. Even though we engage in traditional media and social media to gain wisdom and advice on how to lead, we continue to see a huge discrepancy between what is written and how leadership is played out daily in the real world. The hard, business skills are important in leading. However, it is the soft skills; communication, emotional intelligence, and shared vision, that produce greater loyalty and productivity amongst staff. In a Gallup Poll conducted in 2014 on employee engagement, it was discovered that 31.5% of employees are engaged in their work, leaving 68.5% of Americans disengaged from their jobs. 17.5% are actively disengaged. As in, they are actively not engaging in their work. Gallup defined engaged employees as those who are involved in, enthusiastic about and committed to their work and workplace. As I thought about this more, and my own current work situation, I began wondering about the type of leaders they have. Could it be that the job in and of itself isn’t bad, but they work for someone who is a micro manager? Or someone who does not know how to communicate? Could the problem be not only with the individual worker (as some blame for disengagement is the employees), but with the environment and culture leaders are creating in the workplace? What if leaders understood that their employees aren’t only employees, that they are people with hopes and dreams and families? What if leaders learned to communicate in such a way that shared vision created greater buy in from employees and greater productivity? What if leaders actually did what they thought was right, instead of what they thought they should do? What if leaders began to lead their staff, instead of simply managing their staff? What if they embraced a different type of leadership? It is time we rethink the way in which we lead our organizations. Instead of dictating what is going to take place, get key players in the room to ask their opinion and brainstorm for the best solution. When holding the meeting regarding a change in procedure or process, cast vision for what is to come and why it benefits the employee and the company. And when your employee has a sick child, asking the simple question of how the child is doing when the employee returns to work will make a world of difference in how that employee approaches his day at your organization. How are you leading in light of the questions above? I often have bad days. And if you are human like me, you do too. And when I am having a bad day or I am in a bad mood, that is often when the filter in my brain is lacking. I like to think of my filter as a water dam. When the dam is fully constructed, or my filter is in full effect, I get to keep all of the thoughts, especially the mean ones, in my head. When the dam is weakened, those thoughts seem to flood my mind and spill out of my mouth. I try not to live in that place often, but sometimes it happens. And I usually regret whatever I said or did. When it does happen, it reveals my character. Character is the mental and moral qualities a person possesses. When the boss is away, do you have the same work ethic when they are at work? Do you use the same type of language all of the time? When your spouse is not with you, do you behave in a way that is honoring to them? When you realize you have been undercharged for an item, do you go back inside the store? When the camera is not on you, do you speak to others with kindness? This week, Britt McHenry fell victim to her own character, and unfortunately has made herself an example. You can watch the video here. Warning, she uses some colorful language. At one point in the video, she is even told that she is being recorded. I am not sure if the video was spliced or if it is all in the order of how the conversation truly went. What it looks like though is she was told she was being recorded, yet continued to berate the employee. Who she IS was shown in that video. When she thought no one was watching, her true colors were shown. I am reading Jon Acuff’s new book Do Over. If you don’t have it yet, I recommend going to Amazon immediately and purchasing it. You can click on the link under “Books I’m Reading” on the right side of this screen and get it. In the section regarding relationships, he reminds us to keep any proverbial matches away from digital bridges. Since it seems everything is digital these days, or can be put on the internet in an instant, it is a helpful reminder that our character will become known to all. 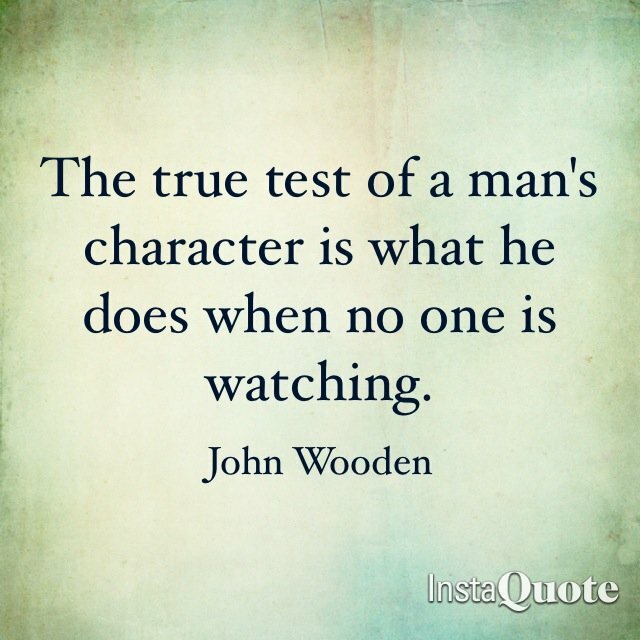 Your character will come through in your twitter feed. Or your Face Book posts. Who you are will shine through. Are you who you want to be? And if not, what are you going to do about it? Conflict happens everyday. It occurs when a sibling or spouse disagrees with us. It occurs when our kids do not do what we ask them to do. It occurs when we choose to ignore a task being asked of us. It happens with co-workers and our bosses. Basically, it occurs because we are all different with varying personalities and perspectives on life. Conflict cannot be avoided. There is a stigma associated with conflict. We are told conflict is not good. So we avoid bringing up an issue that bothers us. We act passive aggressively towards the person who has offended us, even though they might not even know there is an ongoing conflict. A couple of weeks ago, we had new neighbors move in. They are a young couple in their mid-twenties and have no responsibility on the weekend (from what I can tell). They officially moved in on a Saturday. That night, they had friends over. And had a really good time. I’m all about having a good time, especially on the weekend. However, we have two little ones who do not know the definition of sleeping in and our bedroom is right next to their backyard. They were in and out of the house until 4 am. And were loud. Do you remember I have kids that wake up at 630 and have no concept of the weekend? I wanted to call the cops on them (because I am a bad neighbor), but remembered my own principles regarding communication and decided I would address it in the morning. And by me, I mean my husband. (What? I would have gone but left the house at 730 that Sunday morning and thought it wouldn’t be very neighborly of me to knock on their door…after all, they had only been asleep for a few hours). My husband approached our neighbors with kindness yet was firm. A mutual respect was gained that day and our neighbors now understood it was a problem for them to be in their backyard and loud until the wee hours of the morning. If we had not taken the time to talk with them, we (I) would have been very upset when it happened the following weekend. When we are fueled by emotions, we have a hard time communicating the problem. Take time to cool off before engaging in conflict resolution. Is the issue really the problem in front of you? Make sure you have a grasp on what it is you want to communicate. 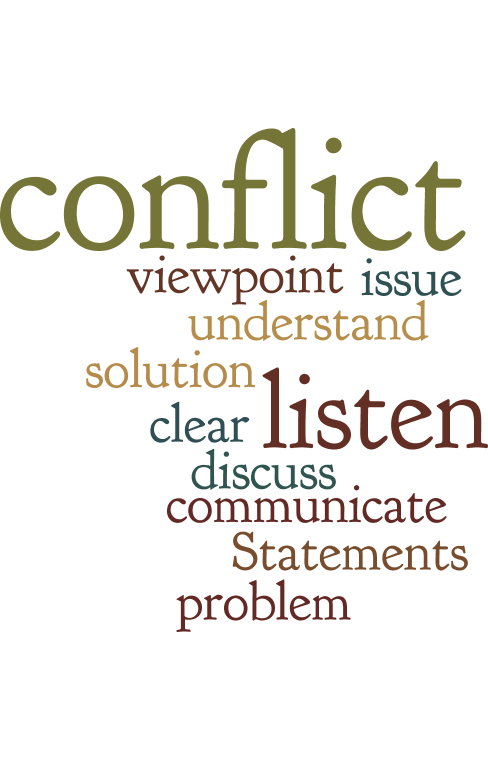 Make sure you can state the issue; what is causing the conflict? If you can’t state the problem, then the other person will most likely not understand the problem. Using “I” statements help to own the problem and communicate the problem from your point of view. It also helps the other person to not feel attacked. 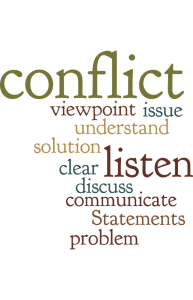 When we are in conflict, we often are not listening to what the other person is saying. We are trying to formulate the response we are going to give and miss out on key information. How often are you actually listening to what the other person is saying? Try to stop your brain from formulating a response and be an active listener. This step is only beneficial if the other person recognizes there is a problem to be solved. Which is why number 3 above is important. Offering a couple of different solutions creates buy in from both parties to move forward with the agreed upon solution. My stubbornness does not always want to choose the high road, and often I don’t. But when I do, I discover I have done the five things above. Allowing the difficult conversations to take place shape our relationships. How do you handle conflict? Kids have a way of putting things into perspective. I am a doer. Type A personality to the core. This comes with a realist perspective. 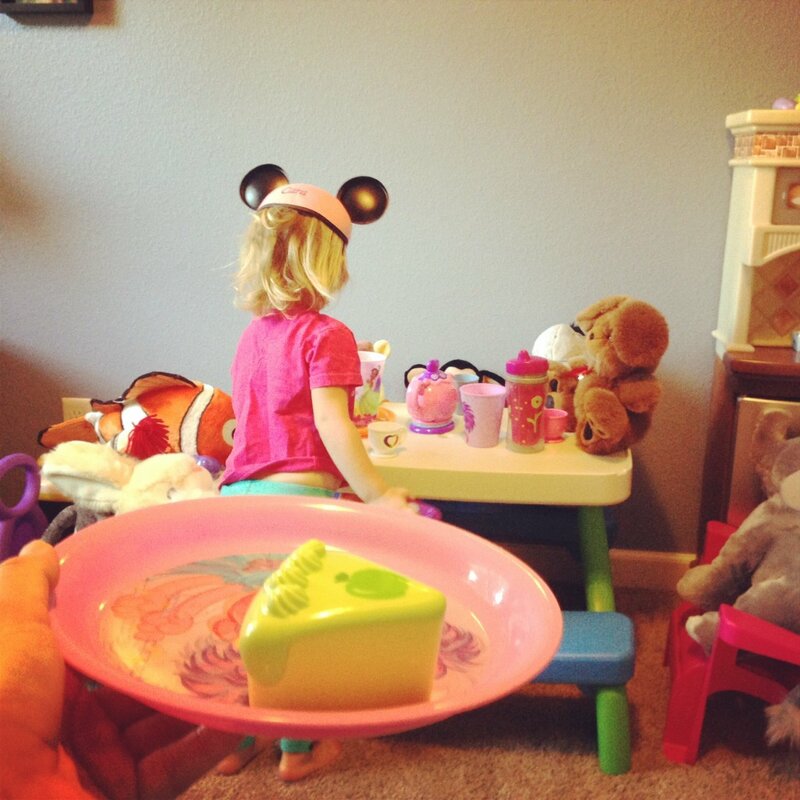 I have a hard time putting the to-do’s out of my head and focusing on playing with my kids, even during down time. I’m checking my phone, putting stuff away (because there is ALWAYS stuff to put away), or trying to quickly clean something, anything! Recently, I have tried to keep my phone or computer out of arms reach when I am with my family. I have tried to ignore the dirty floor or the pile of dishes. I try to ignore the bills but those still have to be paid. And do you know what has happened? I see my daughters in a whole new way, especially my 3 year old. Her imagination and care-free spirit has captured me. Yesterday she went on a safari in my parents back yard. She saw lions, elephants, and giraffes. All in the midst of nothingness. When did I lose that free spirit attitude? When did I become an old, stuffy adult? I had a random holiday for work that allowed me to spend extra time with my daughters. We laughed and played and laughed some more. And I was able to be care-free. I watched my daughter twirl and jump, and I joined her. Sometimes, the to-do list has to be put away. Things need to be dirty. And we need to be fully present. Just another step in creating the balance and getting my priorities right. I don’t always get it right, but when I do, the joy is unexplainable.